Home equity is on the rise — in a big way. According to Black Knight Financial Services, homeowners gained a collective $260 billion in additional home equity in the first quarter of 2016. Daren Blomquist, senior vice president of RealtyTrac, says this growth indicates “borrowers are regaining both home value and the confidence needed to increasingly leverage their home equity.” It’s a trend retail bankers have been eyeing for some time, and many have responded by building up their home-equity line of credit (HELOC) business — a strategy that’s bearing fruit. RealtyTrac’s U.S. Residential Property Loan Origination Report shows a 10% year-over-year increase in HELOC originations as of Q1 2016, which was also the 16th consecutive quarter of year-over-year growth in HELOC originations. The FHA-insured Home Equity Conversion Mortgage (HECM) offers substantive benefits for older borrowers as well as to the banks and credit unions that serve this market. An April 2016 decision from the Department of Labor mandates that if you act as a fiduciary, you must offer advice that serves your clients’ best interests and disclose any conflicts of interest. Industry experts have speculated that the rule will compel financial advisors to present clients with a wider array of financial products, including HECMs, instead of steering them only toward products that generate commissions. Banks looking to comply with these changes would be well served — and would serve their customers well — by not only offering HECM loans, but also seeking a deeper understanding of the product and how consumers can best leverage a HECM to achieve financial objectives in their senior years. Once upon a time, Wells Fargo and Bank of America originated the lion’s share of all HECM loans, but both exited the reverse mortgage business in 2011. Both banks cited falling home prices as a key factor in the decision, and Wells Fargo expressed additional concern over the risk profile of the loans. As luck would have it, their timing couldn’t have been worse. 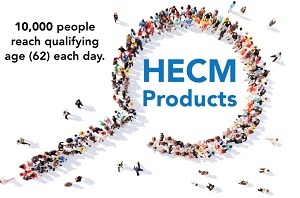 In 2011, HECM was already a product with enormous potential to help consumers and, in so doing, benefit banks. But the evolution of the product since 2011 has been nothing short of extraordinary, and it’s happened in lockstep with a nationwide surge in home values. A study out just this week found that the latest updates to the HECM program have reduced default risk by 50%. Can you think of any other financial product that has turned itself around so dramatically? Substantial changes to the HECM program called the “Financial Assessment” rules were announced in 2013 and went into full effect in April 2015. Financial Assessment improves the HECM program in several ways that are meaningful to borrowers and lenders. For starters, HECM lenders must now review a borrower’s credit history, income, assets, debt and payment history on property taxes, insurance and HOA fees as part of the loan qualification process. If a borrower’s credentials are weak, lenders can either deny the HECM loan or set aside a portion of the loan proceeds to ensure payment of property taxes and insurance in an account called a life-expectancy set-aside (LESA). Other recent improvements to the HECM program include adjustments to the amount of funds that can be disbursed in the first year of the mortgage and the impact of that disbursement on the cost of the borrower’s mortgage insurance premium (MIP). Unlike the property mortgage insurance (PMI) issued for a traditional mortgage, MIP protects the lender and the borrower. Further limits on first year disbursements encourage borrower’s to use HECM proceeds over time in a more sustainable way. Speaking of insurance, the Federal Housing Administration (FHA) guarantees that borrowers will be able to access their approved reverse mortgage funds even if the loan balance exceeds the home’s current value. On the other hand, neither borrowers nor their heirs or estates are held responsible for loan balances that exceed the value of the home. Similarly, lenders are guaranteed they will be repaid in full when the home is sold, even if the loan balance is more than can be recovered from the proceeds. While their robust FHA-insured status makes for higher HECM origination costs, the long-tail protection dispels borrower and lender risks. The reason for the reverse mortgage industry’s commitment to self-improvement is simple: consumers need a product like HECM. That was true when the very first reverse mortgage was invented in 1961 to help a widow stay in her home. It was the driving factor when the Reagan administration formalized the FHA-insured HECM program we know today in 1988. And it’s especially true now, in light of skyrocketing healthcare and housing costs that make even the most well-funded seniors feel a bit jumpy as they face long retirements. Banks that offer HECM products can help alleviate Baby Boomers’ concerns over long-term Social Security funding, low returns on investments and lackluster senior housing options while solidifying their reputation as a trusted source of financial services advice. If 65% of retirement-age homeowners own their home free and clear, it follows than another 35% are still plugging away at their mortgage payment. As income dwindles and expenses like healthcare steadily increase, HECM offers a way to eliminate that monthly mortgage payment altogether. And, just because a HECM is usually thought of as a means for the borrow to receive payments does not mean that they cannot make payments to continue to retire existing home debt. With a line-of-credit HECM, the borrower can choose—each month—to make a payment, receive a payment or do nothing. This is the ultimate in mortgage flexibility. Using HECM funds as an alternative source of retirement income enables consumers who are considering taking Social Security early at a reduced rate to wait for full benefit age. For the current generation of people approaching retirement, eligibility begins as early as age 62, but consumers must wait until age 66 to receive their full benefit. The penalty for taking Social Security early is around 7% per year — for life. On the other hand, those who wait 48 months beyond age 66 to draw on Social Security receive 132% of the benefit to which they’re otherwise entitled. Once retirees begin withdrawing money from their investment portfolios, the sequence of returns — the timing of when the financial market has good years and when it has bad ones — can have a major impact on wealth. Two people who begin retirement with the same amount of savings can have different financial outcomes depending on the sequence of returns they experience — even if they earn the same average return over the course of retirement. In the “sequence of returns” strategy, borrowers rely on different sources of retirement income depending on how the stock markets perform. When markets are favorable, borrowers use their normal retirement savings to pay for living expenses, leaving their HECM credit lines untapped. When the stock market performs poorly, retirees switch to drawing on HECM lines of credit to pay for living expenses, leaving investment portfolios alone until the markets recover. Without the HECM option, borrowers must draw on their normal retirement savings regardless of market conditions — and that depletes portfolios at a much faster rate. The HECM for Purchase is a special type of reverse mortgage that allows seniors to purchase a new residence and obtain a reverse mortgage within a single transaction, without the need for a second closing. This little-known product can make all the difference for older borrowers looking to downsize or relocate and have no mortgage payment. So where do banks fit in? Retail bankers are uniquely equipped to guide consumers through the HECM application process in a way that comes less intuitively to other mortgage lenders. 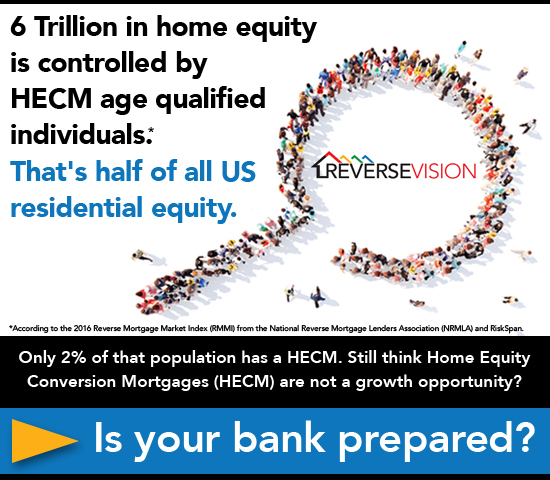 That’s because, despite its moniker as a reverse “mortgage,” a HECM is really a home-equity solution. In today’s competitive real estate market, the typical mortgage lender is programmed to focus on closing deals as quickly as possible. By contrast, with a HECM, the consumer already occupies their home, so it’s not about driving toward a closing date. The key to successful HECM lending is taking the time to educate the borrower on how to use the loan effectively as part of a financial planning strategy. This task is best performed by a trusted advisor — like a community banker. It’s a slower process, but a more rewarding one that allows bankers to strengthen their customer loyalty. If that’s not compelling enough, HECMs offers a much-needed avenue of relief for maturing HELOCs. Most HELOCs require low, interest-only minimum payments for the first 10 years. Then the loan “resets,” meaning the line of credit is closed and the consumer must begin repaying the full principal and interest owed, usually over a 15- to 20-year horizon. The typical 11th-year payment on these loans is 30 to 70 percent higher than the payment in years one through 10, according to Experian, putting many consumers in a serious financial bind. The “payment shock” is expected to significantly increase the number of delinquencies and defaults among HELOC borrowers, which will mean higher incremental costs and significant credit losses for banks. More than three million HELOCs originated during the peak of the housing bubble will enter the repayment phase between now and 2018, leaving banks and consumers scrambling to find options. A HECM could be the ideal solution for HELOC borrowers over 62, especially those who don’t have the income to quality for other HELOC relief options. And by offering HECM as HELOC relief, banks can continue earning interest from customers who might otherwise default or look to another institution for a second home-equity loan. Banks are under pressure to regain market share lost to non-bank lenders — especially the growing number of “digital lending” platforms. Exploiting the existing strengths of trust and long-term relationship with senior customers can offset these market share losses. Banks are uniquely positioned as trusted financial advisors to their senior customers. Educating those customers on retirement funding strategies that include HECM loans is a powerful new solution. Great for the customer, good for the bank’s performance and fantastic at bringing new solutions to an important customer base.